"The massacre begins…" Lionsgate has revealed a third official trailer for the horror prequel Leatherface, telling the origin of the evil man who would become known as "Leatherface". If you're still not sold on this horror, maybe one more trailer will do the trick? (I doubt it.) But fire it up anyway. This is the long-awaited prequel to Tobe Hooper's original horror classic, The Texas Chain Saw Massacre from 1974. Just incase you needed an origin story. In this film, Jessica Madsen plays one of four inmates from a mental hospital - the other three played by Sam Coleman, Sam Strike, and James Bloor. They kidnap a nurse, Vanessa Grasse, and take her on a "road trip from hell." The full cast also includes Stephen Dorff, Lili Taylor, and Julian Kostov. Still not into this at all, doesn't seem that interesting, but maybe that's just me. Enjoy. You can also still watch the first red band trailer for Leatherface here, or the bloodless, second trailer. In Texas, years before the events of the Texas Chain Saw Massacre, in the early days of the infamous Sawyer family, the youngest child is sentenced to a mental hospital after a suspicious incident leaves the sheriffs' daughter dead. Years later, he kidnaps a young nurse and escapes with 3 other inmates. 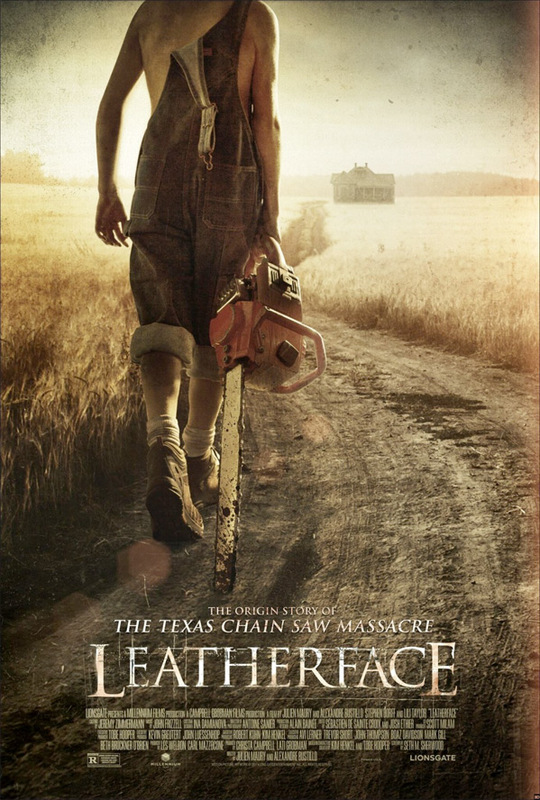 Pursued by authorities including the deranged sheriff out to avenge his daughter’s death, the teen goes on a violent road trip from hell, molding him into the monster known now as Leatherface. Leatherface is co-directed by French filmmakers Alexandre Bustillo and Julien Maury, of the horror films Inside, Livid, and Among the Living previously. The screenplay is written by Seth M. Sherwood. Lionsgate Premiere will be releasing Leatherface in select theaters + on VOD starting October 20th this fall, just in time for Halloween. You in?